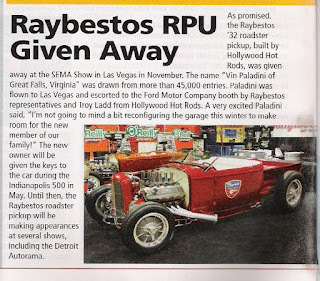 I just want the world to know I am not the winner for the Hollywood Hot Rods built roadster-pick-up for the Raybestos company. Despite my three entries submitted into the contest --somehow this guy in Virginia won it. Good for him! Besides, I have too many other cars anyway. So this may be old news to some of you, but I just found this out in my latest issue of Street Rodder Magazine. Trust me, that's the car. I've seen the car may places. First time was at Troy Ladd's shop being built way over a year ago. It was bare metal frame. Then later as a complete car, less paint. Now painted, it was at the Long Beach Motorama in October. There it is, in front of Chris Casny's coupe. 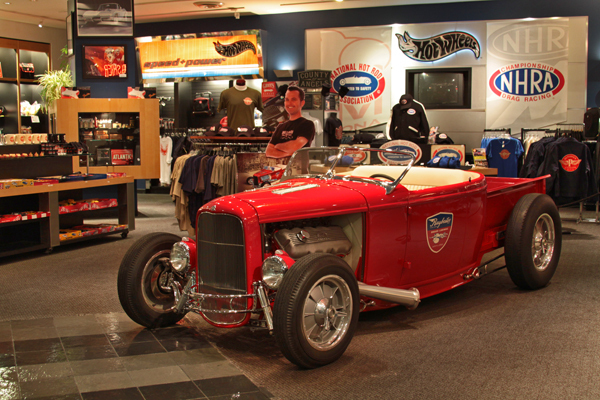 The last time was in January at the Petersen Museum with a cardboard cut out of Troy standing next to it. At what point do you get famous enough to have a life-size cut-out of yourself? Here it is in the Petersen Gift Shop, next to a Troy Ladd cut-out. I just found out I didn't win either.